Among humans, being a “tiger mother” means that you give your children a really strict education. This image doesn’t correspond entirely to the role for tigers. Here are 8 of their characteristics that will doubtless surprise you! 1) Tigresses isolate themselves to deliver their cubs. This is the main reason why no birth has ever been observed in the wild. 2) Mothers take sole charge of caring for and educating their progeny. The male is present only in the mating phase, although it sometimes shares its prey with other females and their offspring. 3) Tiger moms are very protective. Indeed, they monitor their cubs very closely and don’t hesitate to attack if needed. They have even been known to kill a male tiger — including the father — when it has represented a danger to the young felines. 4) Tigresses abandon their cubs if they don’t manage to drink their milk shortly after birth. 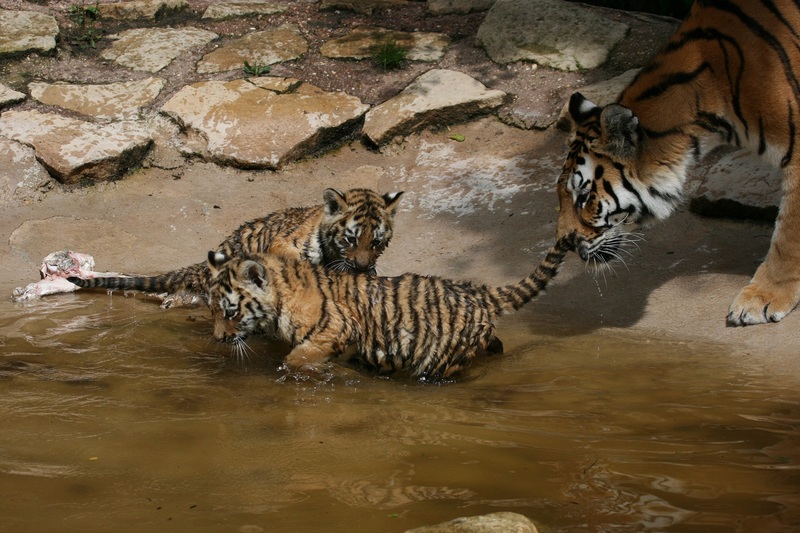 Young tigers have to follow their mother’s heat to move closer to her in order to feed, otherwise the mom will consider that they are stillborn. 5) Tigresses don’t separate themselves from their young, for more than a few days to hunt, until they definitively leave the family group (aged between 18 and 36 months). It’s during this crucial period that young tigers learn to hunt and to become independent. 6) Tiger mothers provide a clean environment for their litter, by ensuring that no food or manure enters their shelter. Furthermore, they regularly clean their cubs by licking them, which has beneficial effects on their health. 7) Mothers mate again only after the departure of the young. Males are the first to leave their moms, followed by the females. This waiting period will be shorter if the tigress has lost her litter. 8) Tiger moms need your support to protect their cubs, particularly from poaching and habitat loss. The species now has no more than 4 000 wild individuals and the mortality rate is very high, as cubs are more vulnerable. Every donation, however small, contributes to tiger survival.